Sri Narayani College of Nursing was started to provide to those who are aspiring to be nurse with proper training. The aim of this institution is to provide an educational programme through which the graduates will assure more responsibility at all level of health care system as professional nurses. 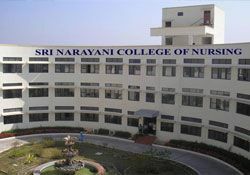 Sri Narayani College of Nursing offers courses in the field of nursing with main objective to create nurses who acquire excellent knowledge and skills for giving best bed side care to the patients.The courses are well designed to equip students with creativity and problem solving skill, to prepare them for rewarding careers and professionals, and to face challenges in a rapidly changing world using modern technologies in profession. Sri Narayani College of Nursing is also planning to start the General Nursing and midwifery course soon.